I received these as my monthly Mighty Nest subscription item; they're an earth-friendly alternative to dryer sheets. 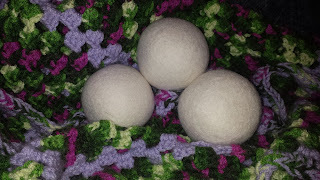 I actually already have my own wool dryer balls. About 2 years ago, I made some with old mismatched wool socks. These Mighty Nest ones are much nicer-looking than my dryer balls but there doesn't seem to be a difference in functionality as I've used both. They are so easy to use: just toss them in the dryer with your wet clothes and dry as usual. I just leave mine in the dryer when the clothes are dry so they're ready for the next load. I was a little disappointed by the packaging: I was hoping for a box I could recycle but instead it was plastic that I had to throw away. Hopefully future shipments will be packaged in a more zero-waste fashion. All in all, however, these are a good first step to eliminate dryer sheets. They're not as effective as dryer sheets in reducing static, but they do decrease drying time. If you feel up to another challenge, I'd suggest trying a clothes rack instead of a dryer. Start with one load a week and see how it goes! I've been using my drying rack for a year now. I still use my dryer for large items like sheets and towels that are difficult to dry, or when laundry piles up from my kids or we need something clean right away. Using a drying rack does require some consistency and planning. It is an excellent way to motivate you keep up on laundry since you have to wash clothes consistently to allow them sufficient time to dry before the next load. You'll be surprised how easy it is to make this simple switch.